‘She is 130 years – a sad looking but beautiful lady. Thistle RR2 is the last of the Rochester bawleys, built by Gill in 1887. ‘She has a 34ft keel, 13ft beam and 5ft draught. Wilkinson, a smack and bawley enthusiast, found her sunk in Kingston-on- Thames. He acquired her in 1976 and, having rescued her from an almost certain bonfire, began a thorough rebuild to get her back afloat and sailing again. It was a remarkable achievement by one man. ‘She was was later owned by Mark Jones and based at Hollowshore near Faversham. 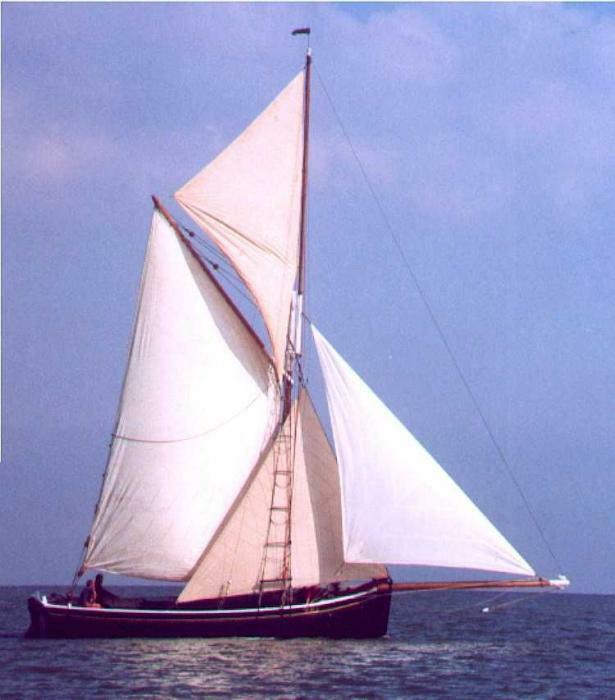 With her loose-footed mainsail, very tall topmast and long bowsprit she was a beautiful sight and was often seen sailing in the Swale, Medway and on the East Coast. ‘Sadly, about 10 years ago, she was no longer looked after, finally sank again, unwanted, and recently it became clear that she was again heading for the chainsaw. ‘But now a group of friends from Iron Wharf appalled by the prospect of Thistle meeting a sad end have stepped in. They got the ‘go ahead’ to re-float the old bawley and at the end of July she was towed to Iron Wharf, where she now awaits further action. ‘The group also purchased her sails and a smack boat dinghy from the previous owner. ‘The aim is now to lift her out for a short time to assess the work and cost to keep her afloat over the winter and at to carry out necessary repairs. Unfortunately her new owners have limited funds and are obliged to appeal for help. For information, please contact Lena Reekie on 01795 229564 or 07968 058398. By the way, I can confirm that her hull form has a lovely ‘just right for the job’ look. Here’s another small slice from Keble Chatterton’s history Fore and Aft Craft. See the previous extracts here, here and here. ‘But it is when we come to study the ten years that are covered by the dates 1870 and 1880 that we begin to see still greater activity. It had been preceded by a fine fleet of cutter yachts that included the famous Oimara, built in 1867, and still used , but as a houseboat in Poole Harbour, above bridge. Her spars were all big, and her great topmast and lengthy bowsprit were characteristic of that period. The tonnage of this vessel is 135, The Aline and Egeria also belong to this period, the former being historic as having been the first yacht to discard the rake which was always given to the mast previously. ‘The ‘seventies saw a real awakening in yachting – a new birth as it were, There were big schooners, cutters, and yawls, and yacht building yards were busily employed. It was during this period that the famous forty-tonners came into being that numbered in their class among others the well-known Foxhound and Bloodhound. The last mentioned has attracted an increased amount of attention by her return to racing during this twentieth century. She was recently altered by Fife, and has done remarkably well in handicap races when we recollect her great age as compared with modern flyers. Under the new modification the Bloodhound was given a raised sail-plan, and the ballast was brought lower down. In addition to this, the forefoot was cut away, and she was thus made quicker in stays. ‘But besides these celebrated forty-tonners we must call attention to the equally famous Jullanar, which was representative not of a class but as a special and original creation. 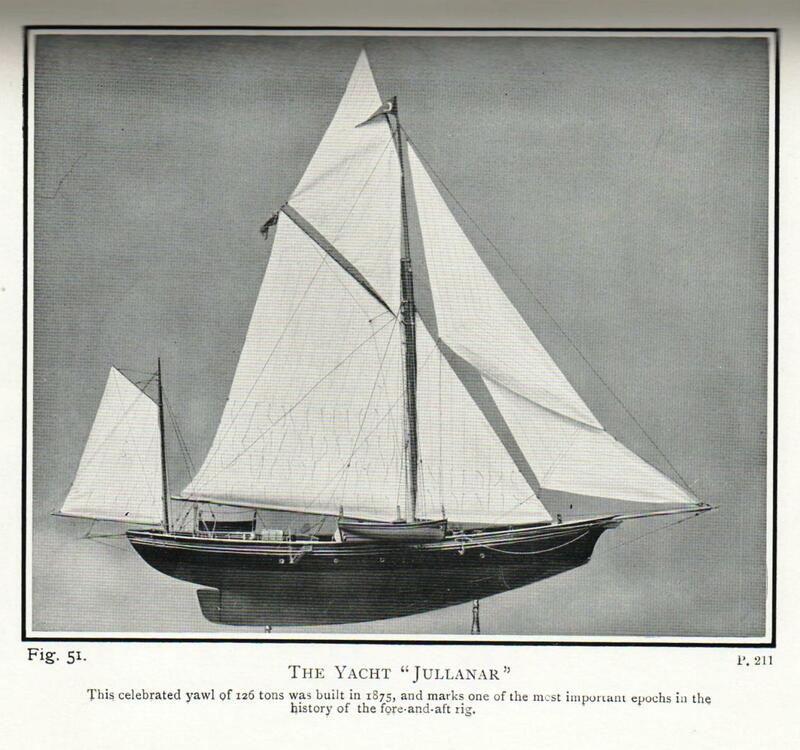 The Jullanar, which we have here reproduced in Fig. 51 [see above], from a model in the South Kensington Museum, is indeed a milestone on the road which begins in the late sixteenth century and reaches on the the present day. Perhaps there was no designer of the fore-and-aft rig of our own time that did so much for this development as the late Mr G L Watson. His name was associated with a fleet of crack yachts that is too numerous to give here. And when it is remembered that Mr Watson frankly admitted that he himself was considerably influenced by the lines of the Jullanar, we have every right to regard this vessel as one of the highest importance. To some extent the excellent illustration here will speak for itself, and the fewest words will suffice to demonstrate her special features. Her birthplace was in Essex, that county which has brought forth so many famous craft and equally famous sailor-men. The last time I looked, Amazon had just a few copies of Fore and Aft Craft .